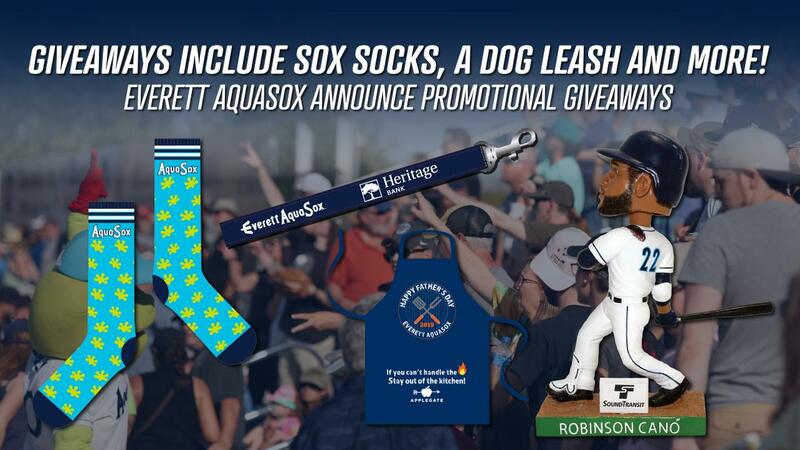 Everett, WA - The Everett AquaSox are proud to announce their 2019 promotional giveaways! Opening Night, Friday, June 21 will kick off the first of six Funko Fridays. In addition to the Funko Fridays, the giveaways will include a unique Robinson Canó Bobblehead, Make-Up Father's Day Apron, AquaSox Socks, a Dog Leash and more! Opening Weekend starting Friday, June 21-Sunday, June 23 will offer fans a variety of marquee promotional giveaways. Friday night, the first 2,000 fans will receive our Magnet Schedule Giveaway presented by Tulalip Resort Casino. Saturday night, June 22 the first 1,000 fans will receive a Robinson Canó Bobblehead featuring his swing from one of his two home runs he hit while with the Sox. Sunday will cap off the Opening Weekend giveaways with a Make-Up Father's Day Apron for the first 500 Fathers. The wildly popular AquaSox Socks return to Funko Field on Sunday, July 21 for the first 1,000 happy feet. This year's socks will get your feet hoppin'! We didn't forget about your favorite pooch as the first 250 dogs to attend Bark in the Park on Monday, July 22 will receive a co-branded leash from Heritage Bank and Everett AquaSox. This leash will have your dog howling at the moon! On Saturday, July 27 if you are not dressed in your Cowboy or Princesses attire the first 1,000 fans can rock our Navy Alternate Jersey presented by IBEW/NECA. IBEW/NECA is also sponsoring our Trucker Hat on Friday, August 3 for the first 1,000 fans. The first 1,000 fans on Sunday, August 4 will receive our Team Poster Giveaway. To complete your 2019 AquaSox team memorabilia, Joe and Jimmy's Sports Cards are presenting the first 750 fans with our Baseball Card Set on Sunday, August 11. Don't forget about September as the first 750 fans on Sunday, September 1 will receive a Reusable Bag courtesy of Diedrich Espresso. The regular season will conclude on Monday, September 2 with a Drawstring Bag for the first 500 fans from Procura Mortgage. Curious to know more about our Funko Fridays that are on June 21, July 12, July 26, August 2, August 16 and August 23? Funko Fridays will offer fans Funko related items and promotions at every Friday home game. Stay tuned for a special announcement with more details about these six exciting nights!